V’s exam week is finally over and we all need a breather, something new and definitely not inside a mall. The weather now is just perfect to be spent outdoors. Daddy C suggested that we drive to Dubai Miracle Garden since we haven’t been to the place yet. It was Friday afternoon and the place was packed with tourists and locals. We’d like to visit the garden on a weekday and enjoy a quiet morning appreciating all the flowers in bloom. LittleMan V had fun running around, smelling the flowers and teaching LittleMiss C the colors. She had fun copying whatever her big brother was doing. LittleMiss C and her awkward picture pose. 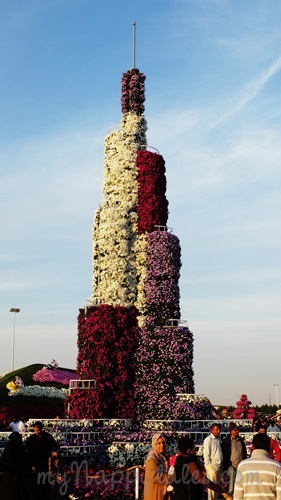 Dubai Miracle Garden has about 45 million flowers in bloom, presented in stunning topiary designs of pyramids, flower beds, and Burj Khalifa. Flower designs will change every year so returning visitors will have something to look forward too every season. Food stalls are available for you to grab a quick bite, but I do suggest that you don’t visit with an empty stomach and it’s always a good idea to bring your water bottle from home. Entrance fee for adults and children above 3 years old is Dhs 20. This looks so much better than last time! Must visit again. Previous PostHappy Healthy New Year!